Like most Anderson-era Yes fans, I went along to this one with a modicum of trepidation. How would Jon's voice stand up – given his advancing years (72, now) and his well-documented health issues? Well, it delights me to relate it was just fine this evening. Perhaps not as strong or as crystal clear as in days of yore, but 'twas unmistakably his. There may have been a slight wobble during Perpetual Change, but Heart of the Sunrise was superb. Indeed, as I commented to Wife at the time, he did a darned sight better job of it than his lookalike/soundalike in the current Yes line-up achieved, when I saw them last year. It was a sheer delight to hear him sing Your Move, Long Distance Runaround and And You and I - even if musically I find the last-named more turgid than majestic these days. Never the most robust looking of individuals, Anderson does look as if he would benefit from a few decent square meals though. I don't know if he is still persisting with his vegetarianism nonsense. One chap whose frame could by no stretch of the imagination be described as elfin is Mr Wakeman. Not only has he expanded outwards a touch alarmingly of late, but (utterly illogical I know) also appears to have grown a few inches taller. He wandered just a few feet past our seats during his and walkabout, and he really is an impressive mountain of a man. His fingers have lost none of their dexterity, thankfully. Although, as ever when I have seen him play with Yes, he does appear to be rather underused, and I doubt if much that was asked of him this evening came close to taxing his talent. A brief piece of doodling as an intro to Hold On aside, his only showcase came during the second part of Awaken. The third member of the ARW triumvirate is Trevor Rabin, who had been the guitarist in Yes between 1982-1994 i.e. during both the American AOR phase, and the shambolic Union debacle - a period I (like most Brits) never had much time for. Rabin's presence meant there would inevitably be a number of tunes from this period aired tonight, so it felt an appropriate opportunity to perhaps reappraise a few of the songs from that time. Cinema, which opened the show, is a relatively innocuous instrumental which doesn't really go anywhere of note – it actually sounds like a Steve Hackett album filler. Hold On and Lift Me Up, however, were each as grim as I recalled: limpid-pop with toe-curling lyrics. Changes featured an potentially interesting gamelan-influenced intro, but this was soon discarded, as the band morphed into some anodyne REO Speedwagon/Journey hybrid. Rhythm of Love, by contrast rattled along in fine style I have to say; it being imbued with a kick notably lacking in the original recording. Owner of a Lonely Heart, I (reluctantly) acknowledge is sheer quality AOR, even if this evening's rendition degenerated into a bit of a mess once Wakeman and Rabin took themselves off for a meander amongst the audience; Rabin with geetar and Wakeman with one of those guitar/keyboard hybrid thingies. But all in all, I thought it rather brave of the chaps to present the selection they did, rather than just churning out a rendition of the Yessongs album. A truncated version of Roundabout served as an encore, and Jon's vocal performance was so fine, I came away from the gig resolving not to go see Yes again until he is reinstated! This odd-looking instrument Jon is playing is actually a small harp photographed end on. In the background is band drummer Louis Molino. 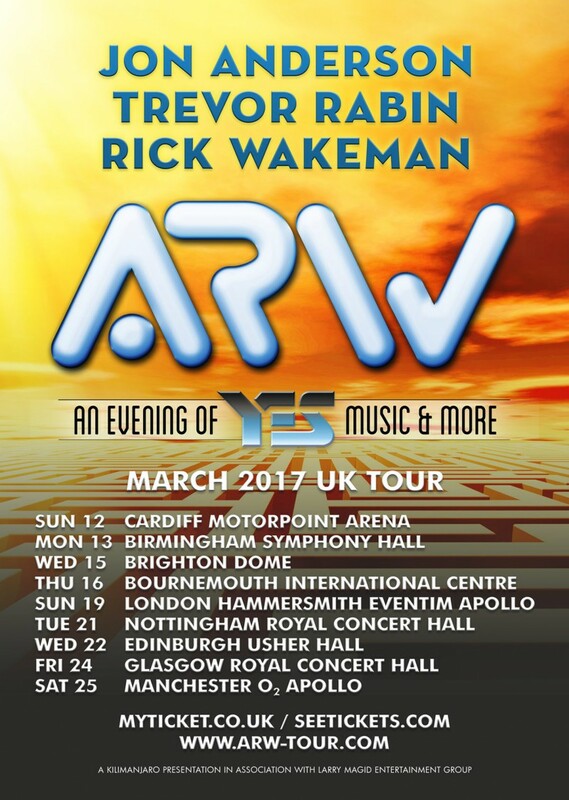 Rabin and Wakeman get set to begin their crowd wandering. Anderson, Rabin & Wakeman - Edinburgh 2017.